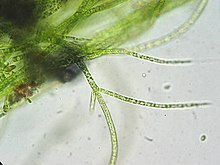 Le̍k-chó (Eng-gí: green algae) sī chi̍t-ê tùi chó-lūi seng-bu̍t ê hui-chèng-sek hun-lūi, tang-tiong hâm Chlorophyta kap Charophyta/Streptophyta, in sio̍k bô kâng ê mn̂g, lēng-gōa koh ū khah ki-chhó͘ ê Mesostigmatophyceae kap Chlorokybophyceae. ↑ Sánchez-Baracaldo, Patricia; Raven, John A.; Pisani, Davide; Knoll, Andrew H. (2017-09-12). "Early photosynthetic eukaryotes inhabited low-salinity habitats". Proceedings of the National Academy of Sciences. 114 (37): E7737–E7745. doi:10.1073/pnas.1620089114. Chit ia̍h siāng bóe tī 2018-nî 5-goe̍h 2-ji̍t (Pài-saⁿ), 11:51 ū pian-chi̍p--koè.